When I first started this challenge, the Motsuni Ramen was not something I was looking forward to eating. In fact, I felt it creeping closer every single day, badgering my mind worse than Ricky Martin ever could. It's not exactly fear because I can eat practically anything. I think it's more so a childhood memory gone bad. In any case, it's time to rise above and eat it for the people! To my surprise, the Motsuni Ramen was actually quite delectable. And although staring at the guts began to initiate a queasy reaction, once it was in my mouth everything was just fine. The soup was magnificent! 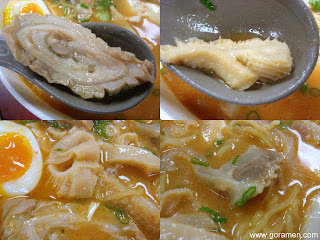 The original miso base achieved a richer flavor from the stewed pork intestines and the added spicy kick really enhanced everything about it. I couldn't help but think that the soup tasted like a better version of Shin Ramyun. And thank goodness for the tofu, I don't think it would have been the same without it. I should've ordered some butter. Now that I'm writing this, I really think some butter would have done wonders. Anyway, if it weren't for this challenge I probably never would have tried this ramen, but now that I have, I feel good about it and might even order it again someday. No side orders today since I didn't want to puke my guts out while playing basketball (no pun intended...okay maybe it was...err). It's also B Diddy's Clippers debut so you know where I'll be tomorrow night! Thx Kat. I'm up for ramen anytime!